Then, on a sudden, Nahar set up a great neighing and stood still. and Oromë wondered and sat silent and it seemed to him that in the quiet of the land under the stars, he heard afar off many voices singing. And Oromë, looking upon the Elves was filled with wonder, as though they were beings sudden and marvellous and unforeseen; for so it shall ever be with the Valar. From without the World, though all things may be forethought in music or foreshown in vision from afar, to those who enter verily into Eä, each in its time shall be met at unawares as something new and unforetold. -J. R. R. Tolkien, Quenta Silmarillion. Lovely photo. And what a great place to watch ballet! Magical image! I love the perspective and the framing…makes the dancers seems like tiny sprites just a few inches tall. 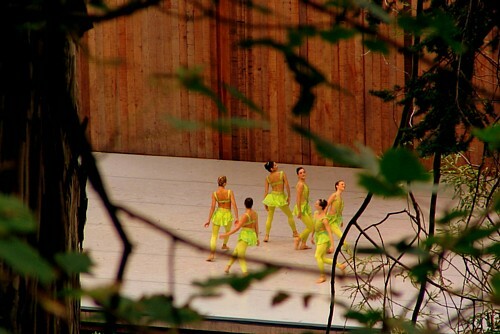 Stefanie: Yes, Stern Grove is an absolutely lovely place to watch ballet. The stage is mounted in a sort of low-lying glade and trees grow thick and tall on hill-slopes surrounding it. Tai: The perspective and framing came about because we were up on the slopes, among the trees, for most of the performance. There was no place to sit in front of the stage, unless you arrived about an hour before the performance began!